This is the title of my book published by CRC Press, New York, in 2011. Please visit the book’s website at http://www.TheProjectLeadershipPyramid.net for more details or click this link for a reading sample (preface and chapter 1). A synopsis of the 5 leadership principles can be found here. 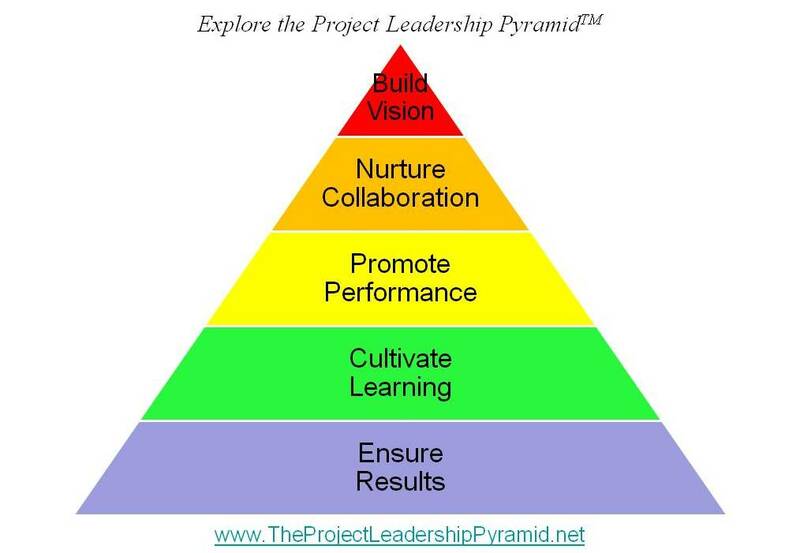 The 5 project leadership principles form the Project Leadership Pyramid. The pyramid is a very powerful image. It has been applied by other authors such as Maslow’s pyramid of needs. I am using the image for a simple reason: While I think that building vision is the most important principle of effective leadership, the bottom line of leadership is results. This explains why vision is at the top and results of the foundation of the pyramid. Collaboration, performance and learning are necessary building blocks for the pyramid. They are framed by vision and results. Visually speaking you first see the top of a pyramid when you approach it from a distance. In our case, vision is at the top of the pyramid. As you get closer you see more of the pyramid until at last you are standing in front of the first row of building blocks (results). Looking upward you may feel overwhelmed by the size of the pyramid. It may not even be possible to see the top of the pyramid (vision). Alas, you know that it exits. It was the first thing that you could see and caught your attention. It guided you all the way to the base of the pyramid. If you now want to understand the secrets of the pyramid, you have to go inside. You have to explore the pyramid. – My book explains both the structure of the project leadership pyramid and reveals the secrets inside. The answer is simple. Experience shows that you can best work with a few principles at a time. There are a lot of factors that have to be taken into account for effective leadership. Still, you can work best keeping a very few principles in mind which you actually thrive to live. Academically this is based on chunk theory. George A Miller (“The magical umber seven plus or minus two”, The Psychological Review, 1956) states that the “memory span of young adults is around seven elements, called chunks … around 7 for digits, 6 for letters and 5 for words”. Well, if this holds true for young adults, how it can be different for the rest of us who do not call us “young” adults any more. Fact is that it is easier to focus on 5 principles than 10 or more. 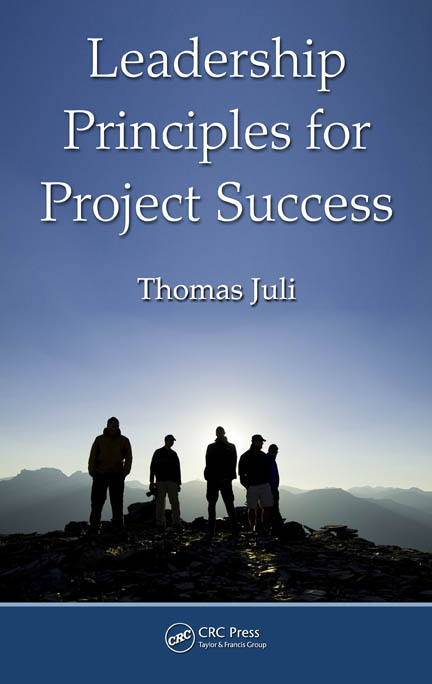 Coming up with these 5 principles I did not limit my search on project management; let it be project management books, best practice or own experience. I expanded my search to our daily world. I asked what distinguishes true leaders from “normal” people and followers. Take Barack Obama, Martin Luther King or John F. Kennedy. What they all have in common is that they talk about their vision of building something new (Vision principle). They inspire and motivate the crowd to make the necessary changes (Collaboration principle). And they did (Performance principle). Their vision is not built in a vacuum. It is based on facts taking the environment into account (Learning principle). And, last but not least, true leaders deliver (Results principle). They do make a difference and you can see it. These findings can be easily translated to the world of projects and project management. The Chaos reports cite poor communication and the lack of executive support as key reasons for projects to fail. Having seen many projects I agree that these two factors are definitely very important. Yet, they stay on the surface. They do not address the most common core cause of project failure: the lack of direction, the lack of a vision, unclear project objectives, different understanding and expectations about the project and what should be achieved. This is why I think building vision is the most important element of effective leadership. last night I had the opportunity to present my upcoming book “Leadership Principles for Project Success” at a meeting of the GPM chapter Mannheim / Ludwigshafen. The presentation is available for download at http://tinyurl.com/GPM091202; feedback is welcome and requested. Congratulations Thomas! This book sounds like a great read. Thomas Juli wrote an article based from his book for “il Projet Manager”, a new Italian magazine entirely devoted to project maangement. This was very welcome and appreciated. Through this collaboration Thomas was very friendly and put in practice the principles of his Pyramid. Therefore he deserves to be recognized as a true author and very worth reading! Thanks for your article!Perfectly written and to the point!